Beth received her Bachelor of Science degree in Nursing from the University of Wisconsin, Eau Claire. She also has a Master of Science/Adult Nurse Practitioner degree from Marion University in Fond Du Lac. 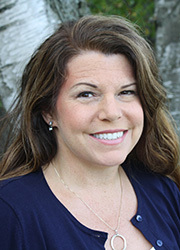 She is board certified by the American Nurses Credentialing Center as an Advanced Practice Nurse Practitioner. Beth is passionate about empowering patients with knowledge to make informed health care decisions and providing compassionate care. In her free time she enjoys spending time with family, gardening, cooking, sailing, and kayaking.